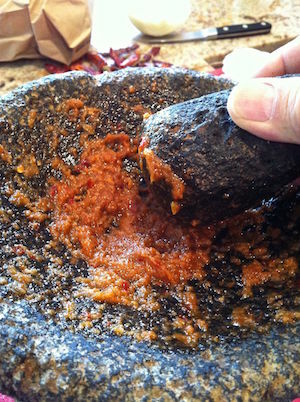 When you want an aromatic salsa on the table, use this Chile De Arbol. Native Mexican, of course, its flavor is similar to that of the Serrano. But unlike the Serrano, chile de arbol is used mainly in its dried form. The name “chile of a tree,” does not mean that the chile grows on a tree but merely implies that the chile plant is taller than other chile plants. Also called the contracted, “Chile Arbol” all over Texas, it is one of the most commonly used chiles in table salsa and, as you’ll find in the recipe below, has a delicious taste, enticing aroma, and vibrant red color.